The design team presented three alternatives to the city council on July 16th. Since the council meeting the three alternatives have been reduced to two alternatives. The design concept and alternatives were developed after extensive public involvement and the design team and the city would like to thank those that have taken the time to get involved in the project. 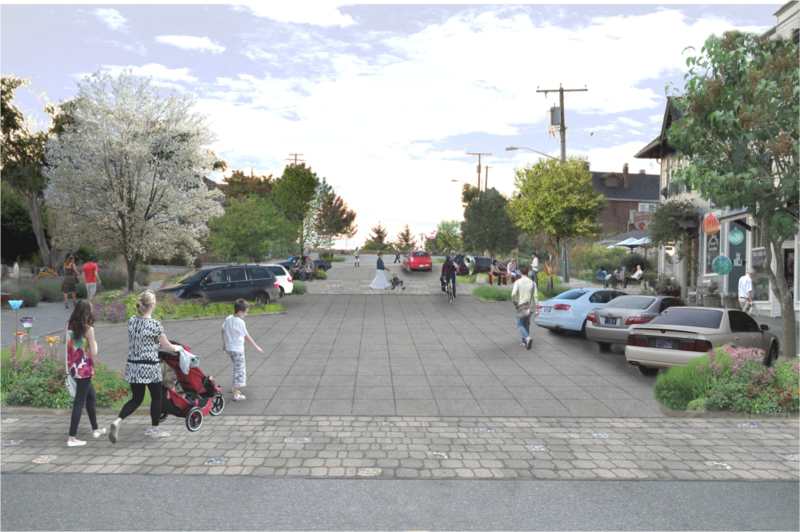 A successful community based design project such as the second street project is not possible without community input. The city council will again consider the design alternatives at the August 6th meeting at 5:30 pm in city hall. Each alternative is designed based upon the same concept, which is to introduce a plaza/flex zone in the center portion of the street (shown on the plans in yellow), to add gateway elements at the Anthes and Cascade/First Intersections and to support pedestrian mobility and comfort while retaining vehicular access for cars and delivery trucks. 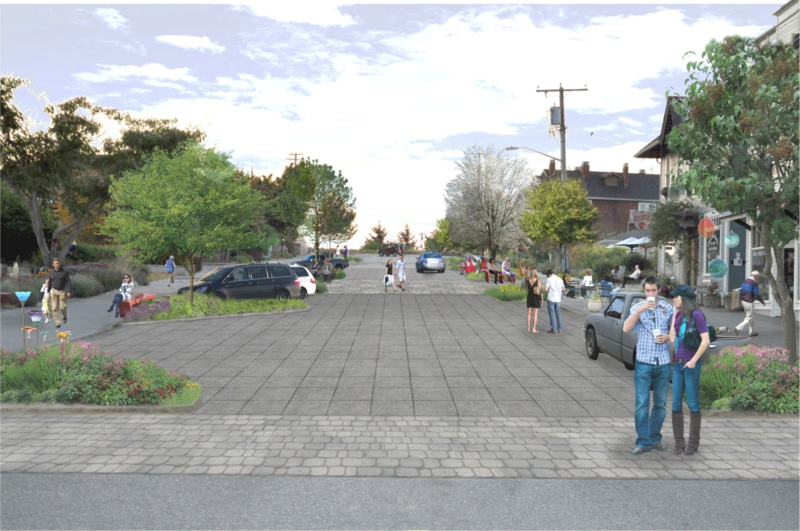 Each alternatives retains the existing character of second street and uses new pavement textures for the crosswalks and the center plaza zone to define the street as more of a pedestrian space. The double yellow street centerline is removed while the utility poles and existing street lighting are retained in both alternatives. Both alternatives provide a central plaza space adjacent to the Firehouse. Truck loading is proposed along Second Street for both alternatives near the intersection with Anthes and may be provided either on the north or south side of the street. The design team and the city plan to have a separate stakeholder meeting to address truck loading in the near future. Summary: Alternative A/B retains angled parking on both sides of the street with the exception of the introduction of parallel parking near the intersection with Anthes Ave. Alternative A/B retains most of the on-street parking, but would result in the loss of approximately 3-5 spaces. Alternative A/B results in the same sidewalk width that is on Second Street today, approximately 6.5′. Summary: Alternative C shifts one side of the street from angled parking to parallel parking and retains angled parking on the other side. Shown below are two variations on Alternative C, one with angled parking on the north side and another with angled parking on the south side. One of the primary benefits of Alternative C is wider sidewalks. 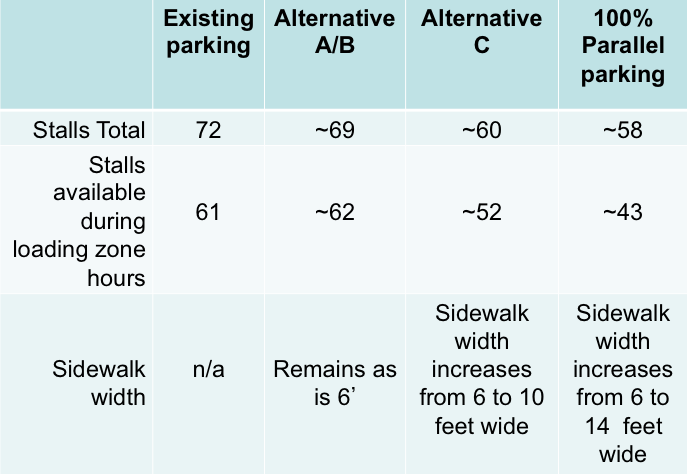 Alternative C would allow for approximately 10′ sidewalks. July 30, 2012 in Second Street Project.